With a hiatus of 7 months, I am back in Ahmadabad as a visiting faculty at MICA (Mudra Institute of Communications). I get into the car with Akbar and politely ask him, if we can go for a gastronomic outing. He politely postpones it for the next evening which is a Saturday. Stupid me, I do not take Akbar’s number, I was stranded high and dry (literally as Gujarat is dry state, sub text prohibition/no alcohol, officially). So I exercise in the gym which is hot and steamy as compared to the January winter in New Delhi, I play soccer, after nearly a few decades, Enjoyed it! Meanwhile dear wife Praveen’s colleague and friend Asif Kadri, sends a car for dinner at Agashiye. Praveen has been t o Agashiye and she constantly influences, to extract me from the slumming I find expertise in. After Vishala and Gopi on previous visits to Ahmadabad many years ago, I was ready for another Gujarati super deluxe experience. Agashiye is the roof top restaurant (literally means “on the terrace”) at the house of Mangaldas Girdhardas a 40,000 sqft mansion built in 1924. 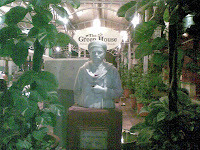 It has a heritage hotel (check out www.houseofmg.com), two restaurants, a banquet lounge, a handcrafted gifts shop, a spa and a swimming pool. It’s located at Lal Darwaza opposite the Sidi Saiyad Jali Mosque. This unique Jali dating nearly 500 years ago has, the sculptured tree of life (in stone)the emblem of logo at IIM Ahmadabad and many years ago was the centre structure of the lobby at The Oberoi, New Delhi. More of that later. 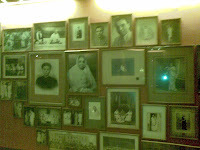 I walk in, past the kurta-pyjama-gandhi cap clad receptionists, past the black and white photos of the Ma ngaldas dynasty. A lift takes me to the top,soft Indian music, an outer lobby, people waiting, I walk in lots of empty tables I ask to seated, I am asked, have I paid at the reception I say no. Have you been served soup and starters in the outer lobby, I say no. I am seated near a Henry Wilson a freelance photographer from UK, we get talking after a while…. He has been visiting India for over 30 years. 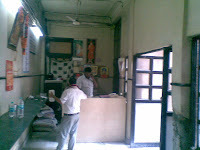 I interact with the senior steward (a Nepalese), though the brochure claims staff from neighboring villages. 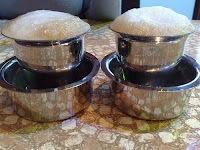 I am served a soup (a Cornish soup), with dhoklas and a cutlet made out of a yam, It’s a super deluxe experience for the inexperienced, a bit clinical, with washing hands at the table with a person pouring scented water and collecting the soiled water in a receptacle. I am served 35 items including a bharta, paneer subzi (with missing paneer), gujarati dal and kadhi, bhakri (wh eat thick roti), bajra rotis ( Henry Wilson remarked only if the rotis were a little softer), khichdi with ghee. 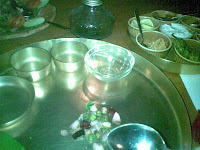 Served in Alloy Thalis, served ,butter and pickles on a betel leaf ( a nice touch),. basoondi , mal puda ,a nice flavorful ice cream as desserts. 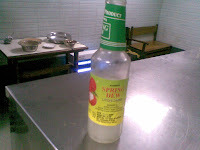 Topped with a pan and lastly ber ( a coarse fruit) as a mouth cleanser. Yes in all 35 items at Rs 400/- a pop. The experience is nice especially for the uninitiated to Gujrati food, good setting, pleasant ambience. The food lacks the scale and opulence of a thali joint, the affection of serving and feeding. I had to wait for some courses. Personally I like the Kathiawadi thali more as it is spicier. Nice super deluxe experience in a historic setting. Well the food, me the blue blooded Indian and Henry Wilson the blue blooded Englishman, both of us agreed have had better Gujarati meals. I missed going to Bhatiyar Galli the last time (that’s last summer, please check my previous blog on Ahma dabad in May 2009) and with a last night’s antiseptic Guju experience. I had to immerse back into the famous galli (lane)of cooks for weddings and contractual cooking… the bhatiyars. On the way to the airport I convince Ahmed the other driver from MICA and the betrayer of the previous night Akbar’s brother-in-law, to take me to Bhatiyar Galli. We go past Mangaldas Mansion and Sidi Saiyyad Jali mosque in the old bazaar we park behind Hotel paramount, . The parking wallah cha-cha (uncle), was exaggerative, when we asked if the Mahindra Xylo would fit in, he said, we can fit in a railway engine. I saw him eating a really enormous pan and remarked about its enormity, he said I will show you one as big as an elephant’s ear. 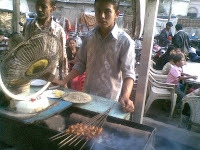 He also said you will not get kebabs as there is some mourning being observed today in the bazaar. 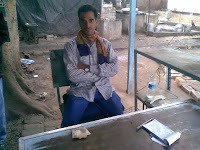 The next sto p a tiny stall in a lane selling tiny meat (I guess again bada) for two rupees each. 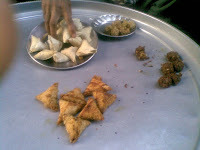 A tiny bite, but the big boys of the famous samosa shops were shut. Next the slightly more activated ZK fry centre (it was around five in the evening). 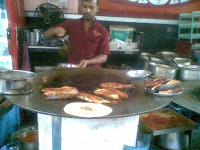 Frying fish on an enormous Tawa, I have a piece of surmai with a roti and onions (Rs 33). 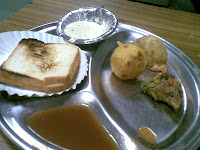 Tawa is generic and peculiar to Ahmadabad. 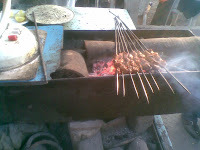 Everything in meat is done on a Tawa, like the Tandoor or the open bar b cue in Northern India. The bazaar sorry Galli is slow and lazy, I am still hungry, I ask for some prawns, yes the owner starts taking me more seriously. 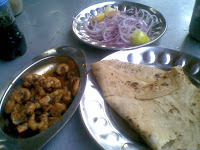 They serve me a plate of tawa fry prawns, onions and a roti all for Rs 53/- I love a Thums Up (Rs20)with the greasy food there is something about the cinnamon zing that’s comforting. 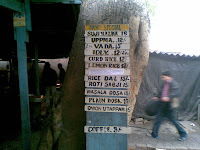 Now here’s is the math 13 +33+53+20 =120.That is Rs 120 for all the yummy stuff, I did overspend by Rs 20 (over the psychological mark of Rs 100 for the eating out under hundred rupee mark). Like, I said before, I never plan it, happy to make it around the benchmark. I top it with an enormous pan for Rs 5 and ask Ahmed to speed me to the airport. I have a beatific smile on my face. I did it even if it was on the way to the airport. 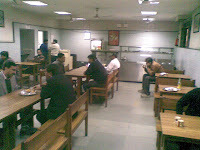 As a rejoined I met some stu dents at MICA, Amit Monteiro and Arunesh and a few others already have a under Rs 100/- eating out club, with an open invitation for new and honorary members. I have got myself an invitation as a visiting faculty and a visiting honorary member to this elite club. On the radar is RK Egg Eatery, Sarkhej, Manek Chowk. Ahmadabad here I come.